For many of our Bronze session skaters, this season will mark their first experience taking Skate Canada Tests. As this experience can be a little overwhelming (for both parents and skaters), the information included on this site will answer some of the questions. For all other skaters, it will act as a reminder of the procedures and time lines to be followed when taking tests. STAR 1-5 program consists of assessments in Dance, Freeskate and Skills. If your child has already passed a Skate Canada Test under the previous system, they will be grandfathered to the appropriate level within the new system. STAR 1 & 2 is the Introduction format whereby the assessments will occur in the skater’s natural training environment, during their lesson time. 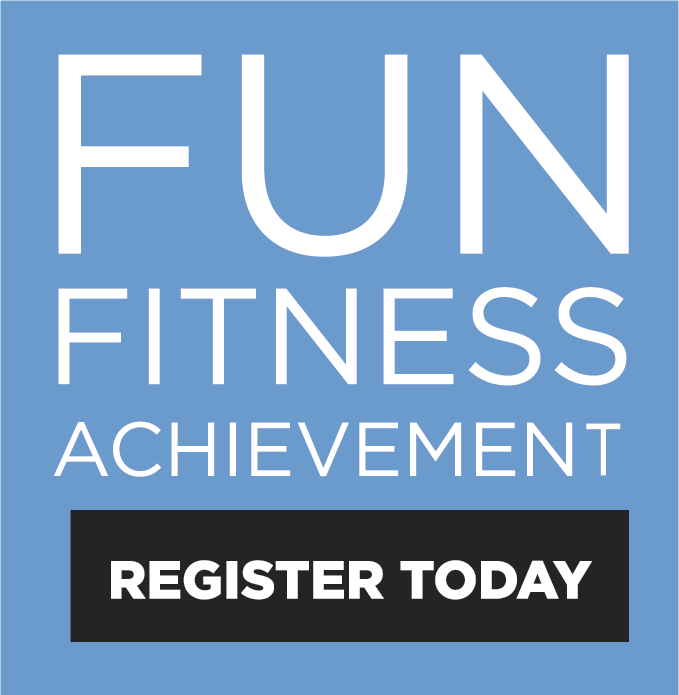 This may be in group, semi or private lessons. Practice attire is acceptable for this type of assessment. STAR 2, 3 & 4 is the Transitional Format. These assessments also occur in the skater’s natural training environment, during their regular lesson time and may also be conducted in group, semi or private lessons. To increase the formality, only skaters being assesses will participate in the assessment. Proper skating attire is required for this type of assessment. STAR 4 & 5 is the Classic Format. 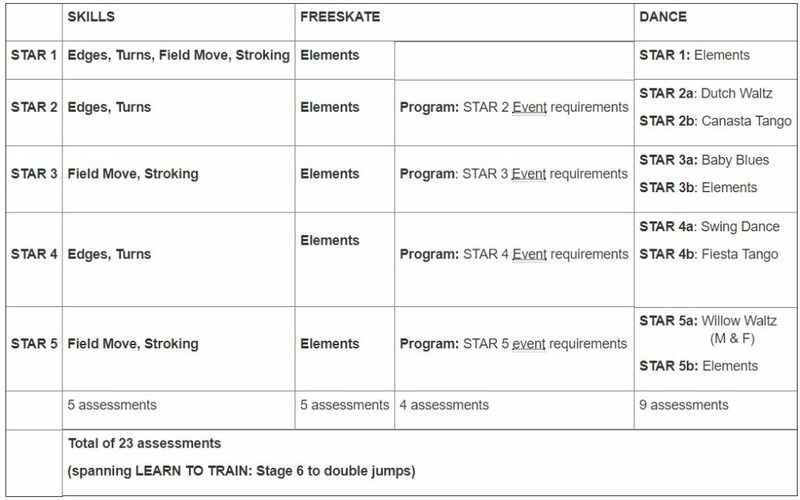 There are 2 assessments in the STAR 5 level that require this CLASSIC format which are STAR 5a Dance, and STAR 5 Freeskate Program. All other STAR 4 & 5 assessments have the option of being performed in either the Transitional or Classic format. Coaches will stand off the ice for the assessment to simulate an external evaluation and skaters will perform their assessment on clear ice. Proper skating attire is required for this type of assessment. The assessment fees are $12 per assessment due and payable prior to the assessment taking place. This fee is provided to Skate Canada. No additional administration fees are required for assessments. 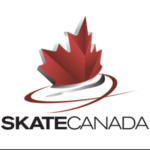 Once a skater reaches Senior Bronze, Freeskate, skills and dance tests are taken on Test days and evaluated by Skate Canada certified evaluators. During formal Test days, there may be session cancellations. Sessions are subject to cancellation based on test schedule and allotted time needed. The Test days are provided in advance on the website. At least three weeks before the Test day, please ask your coach whether you/your child is ready to take a test and if so, which one. Test envelopes will be given directly to the skater by his/her coach. Make sure that all relevant information is filled out on the envelope and that the appropriate fees as listed in this document are enclosed in the envelope. The envelope must be returned to the coach before the due date. As of October 1, 2015 the Skate Canada cost per test is $12. It is your responsibility to ensure that scheduling issues are discussed with the coach as the coach has a specific deadline at which they can make “pulls”. Deadlines for the submission of Test applications will be clearly marked. These deadlines must be respected. They are Skate Canada Test rules which all clubs must abide by. If the deadline is on a day that you do not skate, please submit your application prior to that date! The test schedule will be posted on the SCBC website and bulletin board at the arena approximately one week before Test day. The dates are scheduled prior to the beginning of the season for the entire year. It is a rare occurrence but sometimes we need to revise a test date during the year. If this happens a notification will be posted on the website and the bulletin board in the arena. It is advisable to check regularly for any updates. If a skater is ill and unable to try a test, a doctor’s note must be given to the Test Chair before Test day. Lack of attendance on test day or late “pulls” will unfortunately result in the assignment of “Retry” on the test and the test fees must be paid and will not be refunded. Scheduling: Tests are held on pre-determined days, sanctioned by the Skate Canada – Central Ontario Section. Test days may affect regular skating and will occasionally be tried during the daytime. The skater may be required to attend both days in the 2-day test days if they are testing a variety of Dances, Skills and FreeSkate tests. Test schedules will be posted as soon as available. Schedules will be posted on the Club bulletin board and our website. Scheduling depends on the availability of Evaluators and may change after initial posting. Skaters are responsible for checking the schedules regularly prior to Test Day. All skaters should be at the arena and ready to skate at least 1 hour prior to their scheduled skate time. Scheduling is not an “exact science” and we do sometimes run ahead or behind schedule. Skaters should register with the Ice Captain and their Coach on arrival. Skaters waiting to test should remain in Dressing Room area until time for their warm up. Skaters not checked in 15 minutes before the warm up commences for their test category will forfeit the opportunity to test. No credit will be issued and the test will be marked as a retry. Skaters should be courteous of other skaters taking Tests by keeping the volume of noise to a minimum while in the Dressing Room and by the boards. Parents are welcome and are strongly encouraged to attend and support the skaters. We request that you view your skater outside of the sliding doors or upstairs in the stands. Parents with young skaters, we ask that you put on skates (don’t forget hard guards) outside of the sliding door and proceed to the Ice Captain for check in. Only skaters are permitted past the Ice Captains’ desk. To minimize spectators and traffic, only skaters awaiting their test, coaches and Ice Captains are permitted near the boards for the security and safety of the skaters. When the skater’s test is complete, skaters are to wait in the dressing room or outside of the sliding doors for the test results. Skaters and parents should not communicate with the judges. If the skater requires feedback or clarification on their test sheet, consult your coach. Please check your skater’s record regularly at Skate Canada > Members Only and especially 6-8 weeks after a test day which they took part in to ensure that the records are accurate. Coaches/Skaters are responsible for providing any music outside of Series 8 as permitted by Skate Canada in the document linked above. Coaches must advise the Test Chair prior to the Test day if the Series 8 music is not being used in order to advise the evaluators prior to the Test day. Please consult your coach for guidance on appropriate attire for testing. Warm sweaters and gloves may be worn during the warm-up period immediately prior to a Test. When a skater knows that he/she will be trying a Test, ask the coach if their skates need sharpening. Coaches will be able to recommend a reputable sharpening service. Sharpening should be done a few days prior to the Test Day to allow the skater to get used to the sharpening.